Delicious 100% Apple Bittersweet Elixir Obtained from an artisanal process of slow aging and acidifying cooked apple must, this apples elixir has an intense aroma and a fresh, fruity taste. Born from highly selected ingredients and a completely natural fermentation process, the result is a special taste and flavor experience. AROMA - Decidedly fruity, well balanced and evolved with a refined, complex aroma. FLAVOR - Fruity, warm and mellow with a potent, elegant, long lasting taste. ACCOMPANIMENTS - Our Apple Elixer is delightful with first courses, soufflés, and rice dishes. Wonderful in delicate sauces. Delicious with vegetables, shrimp and shellfish, omelets and other onion based dishes. Perfect on game and pork dishes. Releases its pleasurable aroma over fruit based desserts and fresh cheeses. The special flavor of Figs 100 is extraordinary and complex, a perfect harmony of smooth, sweet tastes, with a slight inclination toward sourness. The structure is noble, the flavor is winning, remaining on the palate like a delightful reminder. In order to obtain such a complex, innovative product, only the best balsams and concentrated juice of absolutely ripe figs are chosen, harmonized with a perfect technique and vast research experience. COLOR - Impenetrable but brilliant black, with reflections of light. AROMA - The scent is persistent and composite, of broad consistence. Prevalent are the rich fig and sweet spice. FLAVOR - Full, delightful to the palate, with a dense, balanced fruity structure. Indeed, the mature fruit tones cannot fail to captivate. ACCOMPANIMENTS - The smooth, refined, velvety taste make this ideal on fresh and aged cheeses. Also great in combination with braised meat and poultry dishes, It also enhances the flavor of fresh fruit salads made with berries, and is the perfect accompaniment for custards, puddings and ice cream. 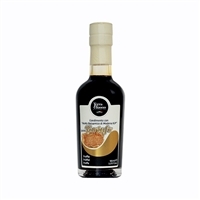 The perfect union of pure pear juice and Balsamic Vinegar from Modena, our syrupy Pear Balsamic is pleasantly intense and aromatic. COLOR - Luminous, golden brown. AROMA - Delicate, refined, lingering pear bouquet. FLAVOR - Subtle and long lasting with a delicate hint of pear. 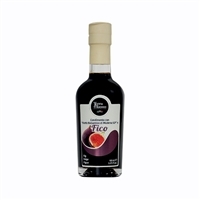 ACCOMPANIMENTS - With its slightly tart fruity flavor and its rich thickness, Pear Balsamic “Capricci” brings out the sweetness in fresh fruits. Its low acidity makes it a perfect addition to ice cream and aged cheeses. Exceptional over salads, vegetables and grilled meats. Truffles 100 is the result of lengthy research and wise experimentation, plus scrupulous respect for the natural excellence of the ingredients. It is a perfect combination of aromas, a balanced blend of scents and flavors, an ideal harmony of tastes. The Truffles and the "Balsamic Vinegar from Modena I.G.P." integrate, intermix, dance together and finally achieve perfect fusion with balance and respect for the diverse personalities, without prevarication or overlapping. COLOR - Dense deep black, shining, with some garnet-red reflections on the surface. AROMA - The scent is very outstanding. Prevalent is the truffles scent, with earthy but fruity notes. FLAVOR - Intense, very captivating and persistent. The first impression is that the Truffles scent prevails; but in the persistent aftertaste, the sweet scent of mature "Balsamic Vinegar from Modena I.G.P." takes over. ACCOMPANIMENTS - Absolutely wonderful on risottos, omelets and other egg dishes. Also ideal as an accompaniment for grilled and roasted meats. Just a few drops liven up a plate of game. Well known and well approved is the combination with crepes and all baked pasta.